Important notice: As of 3-May-2007 Pandora is blocking users living outside the U.S. from using the service, which affects me also. Therefore, I can only offer limited support for this plugin. Inspired by and building upon the great work of Jean-Paul Franssen, who developed a wordpress-sidebar-widget to display feeds coming from Pandora, I have now finished programming a WordPress plugin, which can help you to place Pandora-feeds freely anywhere in your theme-templates. The plugin receives the feeds from Pandora and transforms the data into xHTML that can be integrated into your WordPress themes. To retrieve the feeds, the MagpieRSS-library which is integrated into WordPress is used. WP’s MagpieRSS is configured to cache the retrieved data in your database. This will limit the requests sent to Pandora and increase the performance of this plugin and your site. This is the first plugin I wrote, so I cannot guarantee it to be 100% error-free. However, I have tested it with WordPress 2.1 and it should work fine. It might also work with WordPress 2.0, but this is untested. I can’t help you, if there should be problems connected to WP 2.0 or older. Please don’t post comments, if you need help! Use the forum instead! Thank you. I’m developing this plugin in my spare time, so I cannot reply to every request at once. But I’m willing to help you as quickly as possible. This page you are currently reading should answer all your questions regarding installation, setup and usage of this plugin. If not, please feel free to contact me! 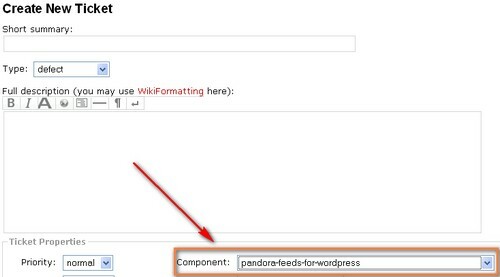 Go to the plugin-section of your blog’s admin-area, scroll down to Pandora Feeds for WordPress Plugin and press activate. 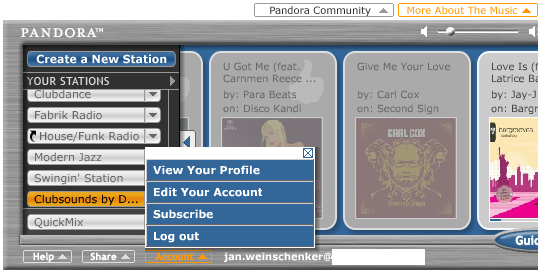 Insert your Pandora-account name into the input-field. You register at Pandora with your E-Mail-address. Your account-name is the local-part of the address. For example, if you have registered with john.doe@example.com, you should enter john.doe into the textfield. Congratulations, you’re done! Now you can adapt your theme. The part of the URL right from people/ is your account-name (jan.weinschenker in this example). The plugin provides three tags that can be used inside WordPress-themes. They are further explained in the following subsections. It is not needed to place these tags inside the WordPress Loop. The tags will deliver lists of xHTML-1.1-listitems (<li> … </li>). That should make it easy to insert them into a static page for example. This tag creates a list of your stations. It should be enclosed inside an <ul>-tag. Notice the CSS-class ‘pandorafeeds-stations’. You can use it to adapt the look of the listitem to your theme. This tag creates a list of your bookmarked songs. It should be enclosed inside an <ul>-tag. Will show the 15 most recent bookmarked songs together with their CD-cover. Will show the same list, but with no CD-covers. %URL_TO_COVER% will be the URL pointing to the image of the cover at Pandora. %TITLE% will be the title of the song. %ARTIST% will be the name of the artist. %URL_TO_SONG_AT_PANDORA% will be the URL pointing to more information about the song. %SOME_DESCRIPTION% will be a short description of the song. Notice the CSS-class ‘pandorafeeds-favorites’. You can use it to adapt the look of the listitem to your theme. This tag creates a list of your bookmarked artists. It should be enclosed inside an <ul>-tag. You can use CSS to design the look of the lists. The following code shows the relevant style-classes, which you can adapt to your theme. If you plan to insert the feeds into your sidebar, the WordPress Pandora Widget from Jean-Paul Franssen will be your friend! Since I will be moving my blog to wordpress, I will definitely give this plugin a shot.